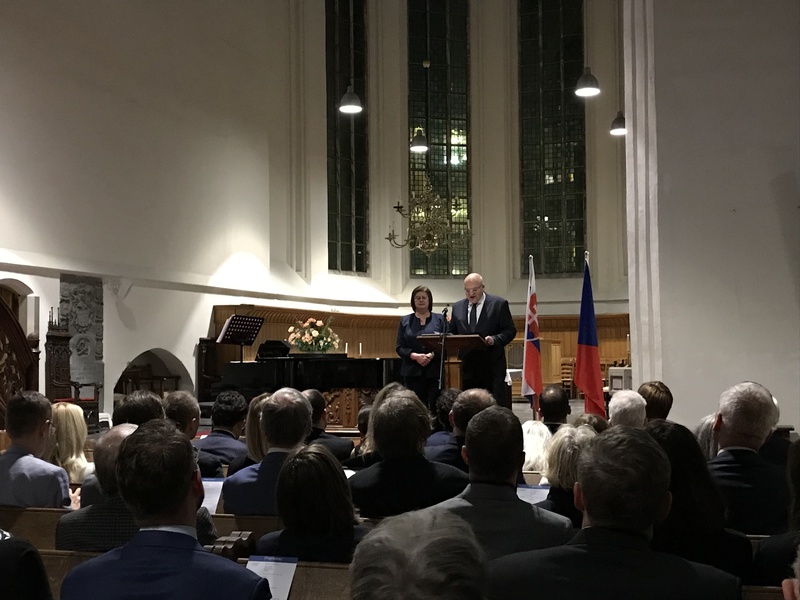 On 30th October 2018, the Embassy of the Czech Republic and the Embassy of the Slovak Republic in The Hague organised a classical music concert to mark the 100th anniversary of the establishment of Czechoslovakia. The event started with the national anthems of both the Czech and the Slovak Republic, after which the ambassador of the Czech Republic H.E. Ms. Jana Reinišová and the ambassador of the Slovak Republic H.E. Mr. Roman Bužek gave an opening speech. Besides welcoming all the guests, they recounted the joint history of the two countries. The concert was performed by the duet Miroslav Ambroš (violin) and Zuzana Ambrošová (piano), both appraised and desired players with combined Slovak and Czech backgrounds. The duet played together 13 pieces from various Czech and Slovak composers, including Antonín Dvořák, Bedřich Smetana, Eugen Suchoň, Peter Breiner and Sylvie Bodorová. The concert was attended by around two hundred people, including ambassadors, heads of international organizations, several members of the Czech Dutch Chamber of Commerce and many other Slovaks, Czechs and Dutch. The concert took place in the church De Kloosterkerk in The Hague. Prior to the concert the Czech Dutch Chamber of Commerce hosted a small friendly gathering for several of its members.